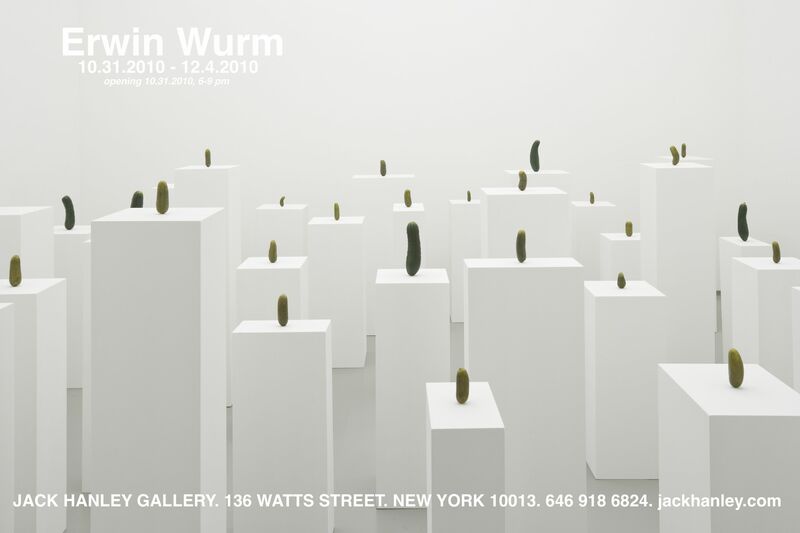 The Jack Hanley Gallery is pleased to present a sculptural installation by Erwin Wurm. 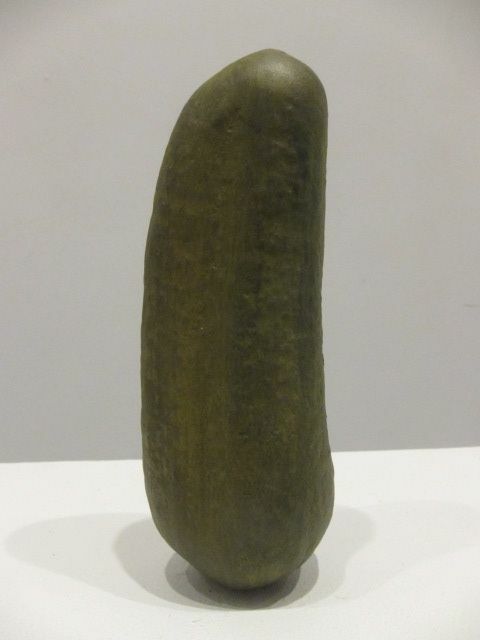 As the title indicates Wurm’s installation, “Selbstporträt als Gurken” presents a portrait of the artist as uniquely cast and naturalistically painted pickles. Though the exhibition was first conceived in 2008, this is its first appearance in the United States. 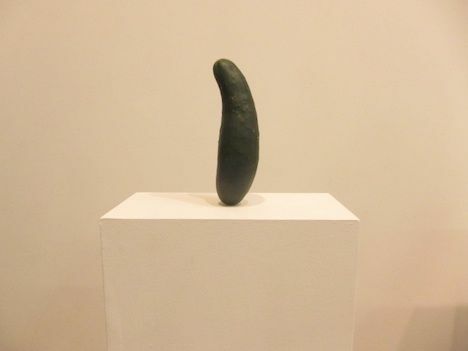 In this, Wurm’s fifth exhibition with the Jack Hanley Gallery, the Austrian born artist continues to employ his country’s beloved pickle to explore the discipline of sculpture in a comical yet honestly inquisitive manner. On the most basic level, the individuality of the twenty-six pickles mounted upon white pedestals mock the concept of a singular identity and Realism’s attempt at accurate representation. Less imperative than they at first appear, the shriveled crooked pickles raised at various heights on pristine symmetrical bases sit back and wait for others to draw correlations. The framing of Wurm’s installation as a form of portraiture poses the question(s), what/who are the sculptures/sculptors? Is a sculptor something other, more or less than his/her own sculpture? 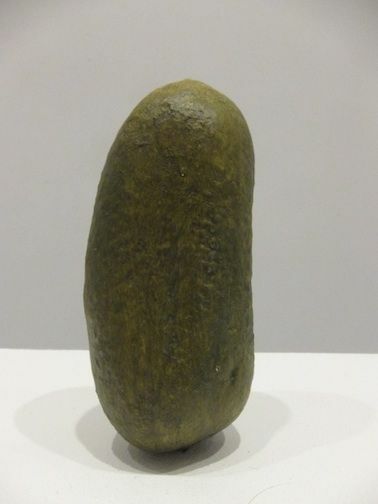 The viewer, forced to walk in and around the oddly juxtaposed objects, becomes the sculptor of his/her experience and part of the larger sculpture itself. Query abounds but in the end Wurm answers his own questions with a laugh at the self(selves) erected all around. Erwin Wurm's multi-disciplinary works including sculpture, photography, drawing and video have appeared in exhibitions throughout the world. The artist’s recent solo shows include "The Artist Who Swallowed the World" at the Kunstmuseum St. Gallen in Switzerland, "Spit in Someone's Soup" at the Konstmuseum Malmo in Sweden, "Erwin Wurm" at the Musee d'Art Contemporain de Lyon in France, and "Glue Your Brain" at the Museum of Contemporary Art in Sydney, Australia. The artist will also be included in the exhibitions "The Original Copy: Photography of Sculpture, 1839 to Today" at the Museum of Modern Art in 2011 in New York. Works by Wurm are included in prestigious collections throughout the world at the Solomon R. Guggenheim Museum, Peggy Guggenhein Collection, the Walker Art Center, Museum Ludwig, Kunstmuseum St. Gallen, Musee d`Art Contemporain de Lyon, and Centre Pompidou, among others.